I was out one night in 홍대, Hongdae, South Korea and saw these socks and got a good laugh. 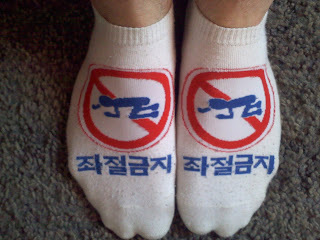 I guess that if you didn't speak a word of Korean you might think it had some very funny meanings. As it turns out, 좌절금지, "Joajoelkeumji", means something like "Don't give up." It's important to note here that this also applies to fashion and that I should not stop trying my best despite my best efforts' failure to attain success. These will run you about 1,000 Won--I suggest you pick some up for yourselves or family members as gifts. pretty cool, glad I'm following you.